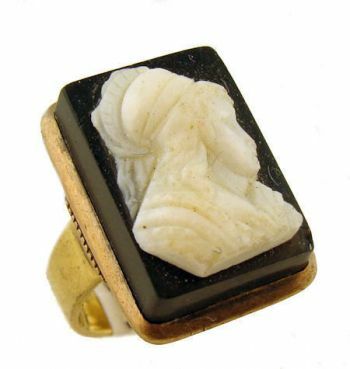 Description: 14k yellow gold Banded Onyx Cameo Ring. 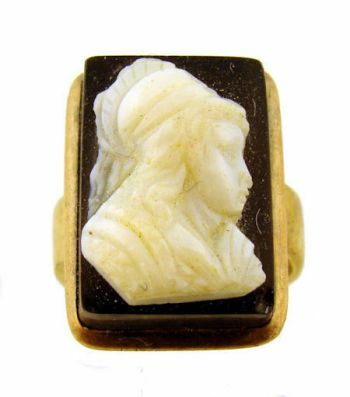 The 15.5 x 11 mm cameo is carved from (banded agate) black and white Onyx depicting a what appears to be a Grecian male or soldier. 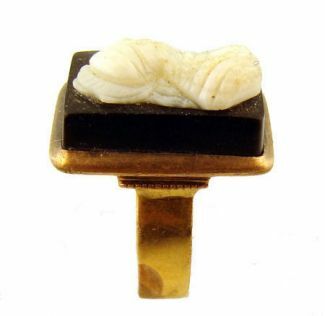 The cameo stands out in high relief and is framed in a plain 14k gold bezel setting on a 4 mm wide flat band. Unmarked. Circa 1880's. 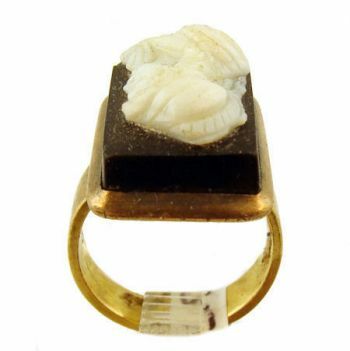 Measurements: The ring top measures 5/8" x 1/2". Ring size 3. Condition: Very good with 2 mm chip in bottom right corner. Shipping time: With in 2 to 3 days or approx. Resizing by us will take approx 2 weeks for laser welding on this ring.